Interesting for commercial use: Clio. 2) By mistake the room acoustics are measured, instead of the loudspeaker. 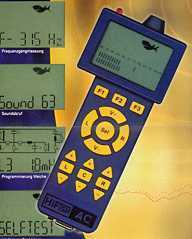 Are you an electronics student or you have plenty of time, know how to check out a measuring system and understand the term Fourier transformation, then we recommend solution a) using programmes like Audiot or Audua (available on the Internet). If you are unsure what or how much to measure or if you would rather like to measure the room acoustics we suggest b). Should you want to develop loudspeakers we recommend a), c) or d). 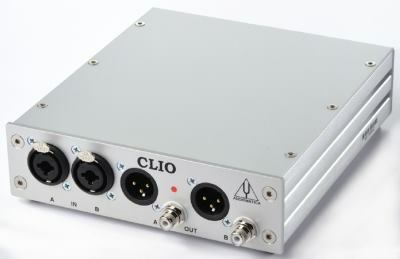 We have found a reasonably priced solution in section d) which we would like to introduce to you: Clio by Audiomatica. This measuring system is absolutely fascinating. Even professional loudspeaker manufacturers think that way. To familiarise yourself with Clio we give you some details. Please give us a call if you have questions or don't understand something. 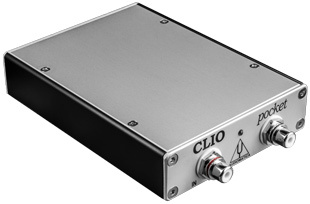 Clio Pocket - for you if you want a professional system for a low price. With this tool your CD player turns into a high quality signal generator, making it a low price measuring device. With the help of the supplied CD (available also standalone) the Audio Controller permits the measuring of frequency response, room reverberation etc. The controller acts like the standard remote control of your CD player (will work with most remotes). Every home-made speaker may be optimised (not designed and developed). Even the sound of purchased speakers, may be improved on, since this system is capable of measuring the influence of bookshelves, wing chairs, damping carpets etc. Well, if this is not enough, there will be additions to the system that may be integrated into your current hi-fi, enabling an analysis without dismantling your speakers. A programmable crossover and a high-end pre-amp have been announced already. The technology is not yet available for 64-bit systems. 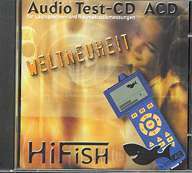 "A terrific gadget, this Audio Controller by HiFish: sound level measuring is done in a jiffy and with the use of the test CD even extensive frequency response tests and room acoustics analysis are performed without a hitch. The accurate calibration of a home cinema system is as easy as the determination of the ideal positioning of the speakers and establishing the hot spot. It's a useful tool in setting-up Helmholtz absorbers (so-called bass traps) and crossover networks. Short and sweet: a tool too good to miss in a hi-fi home. " A docking station is also available now. The station generates the test signals itself, thus replacing the CD player. The station's frequency response is 16 Hz to 20 kHz and is able to generate single tones, sine sweeps and stepped tone bursts.